This darling little mouse t has a nostalgic flavor and easily reminds one of Christmases past. It has just a touch of glitter to make it sparkle. 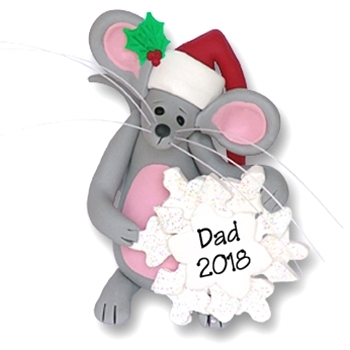 This Christmas ornament may be personalized on the snowflake with a name and a year. It makes a great gift for a child or a child at heart. Handmade from polymer clay and designed by me. It comes complete with a hook and satin ribbon for hanging.